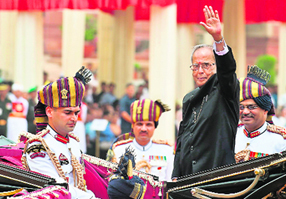 After five decades in active politics, Pranab Mukherjee today began a new innings when he took oath of office as India�s 13th President at an impressive ceremony in the historic Central Hall of Parliament. The Indian Meteorological Department, the nation�s weather forecaster, is all set to downgrade its monsoon prediction for the year. 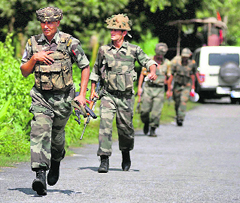 With no let-up in Assam violence, the Army was deployed in the three riot-hit districts of Kokrajhar, Chirang and Dhubri on Wednesday. SPORTS: Who will be fastest man on earth? The raging row over land acquisition in Haryana's Rewari district has been settled for now. After a five-hour meeting between farmers and Chief Minister Bhupinder Singh Hooda here, farmers decided to suspended their agitation. The Haryana Government remains clueless on whether violence at the Maruti Suzuki India Limited plant at Manesar was pre-planned. The Tribune revisits the events that shook the nation following the violence at Maruti�s Manesar plant. Working on Rahul Gandhi�s game plan, the Congress high command has constituted a screening committee under the chairpersonship of Delhi Chief Minister Sheila Dikshit for short-listing probable candidates from the state for the forthcoming Assembly poll.